Just use ONE small FreshPaper sheet for an ENTIRE fridge drawer, fruit bowl, salad bag or berry carton... to keep all you produce fresh for up to 2-4x longer, naturally! FreshPaper is a patented & award-winning innovation that has been featured by The New York Times, The Washington Post, CNN, NPR, The Today Show, Real Simple, Oprah, Mother Nature Network, and Forbes since its launch at a farmer's market. FreshPaper was recently awarded the biennial INDEX: Design to Improve Life Award, the World's largest Prize in Design (previously awarded to Tesla and Apple!) Made in the USA with organic spices. Compostable, & recyclable. Subscribe to the FreshPlan for Produce and save! Get 1 FreshPaper for Produce delivered to you every month. Cancel anytime! Our 8 Sheets of FreshPaper for Produce & 4 sheets of FreshPaper for Brea is all that you need to keep food fresher for longer. 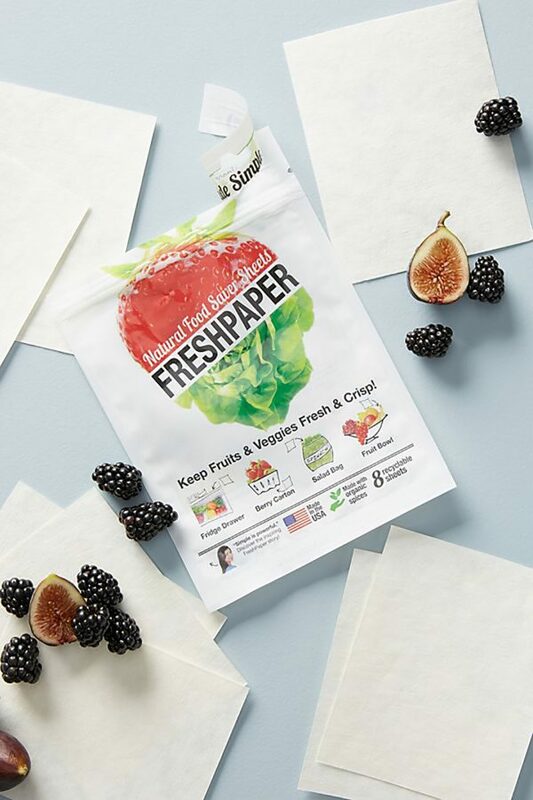 FreshPaper is a patented & award-winning innovation that has been featured by The New York Times, The Washington Post, CNN, NPR, The Today Show, Real Simple, Oprah, Mother Nature Network, and Forbes since its launch at a farmer’s market. FreshPaper was recently awarded the biennial INDEX: Design to Improve Life Award, the World’s largest Prize in Design (previously awarded to Tesla and Apple!) Made in the USA with organic spices. Compostable, & recyclable. Your FreshPaper solution for Produce, Bread & Baked goods. Subscribe to the FreshPlan for Produce and save! Get 1 FreshPaper for Produce and 1 FreshPaper for Bread delivered to every month. Cancel anytime! FreshPaper is a patented & award-winning innovation that has been featured by The New York Times, The Washington Post, CNN, NPR, The Today Show, Real Simple, Oprah, Mother Nature Network, and Forbes since its launch at a farmer's market. FreshPaper was recently awarded the biennial INDEX: Design to Improve Life Award, the World's largest Prize in Design (previously awarded to Tesla and Apple!) Made in the USA with organic spices. Compostable, & recyclable. Subscribe to the FreshPlan for Bread and save! Get 1 FreshPaper for Bread delivered to you every month. Cancel anytime!